Unfortunately some of us Archers are not yet at Olympic standard and so the stands and targets get well pounded by arrows meaning a hazard of splinters when setting up and taking down targets. The club has now purchased some safety gloves which are held in a box within the target shed. We strongly advise that club members use these for their own safety when helping to setup and takedown the targets. A big thank you to Dennis, whose static bow tuning session last Sunday (26th March) went down very well with all who took part. Dennis was kind enough to spend a lot of his time with individual members who wanted to have their recurve bows statically set up. Steve says he has bought a lot more First Class badges as he now expects to see scores go through the roof! Sunday (9th April), I will be running a full tuition/refresher session for anyone who wants any help, reminders, etc – I plan to do this regularly throughout the summer, but this will be the first one, and will hopefully help people who have not shot much through the winter to get back on target…. 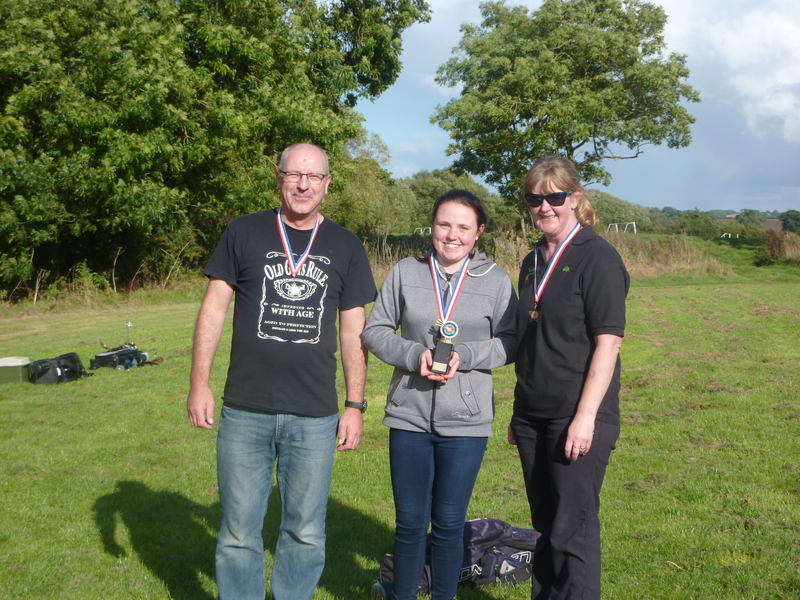 Congratulations to Alex Bolton on coming first, Mike Bolton on achieving second place, and Alison Guest on achieving third place. Our 2015 AGM will be held on Sunday 28th August at 1.30pm, at the range (before any shooting starts). We encourage everyone to come along to have their say on how the club is run, what next years fees will be, and to raise any queries, etc. We will be holding our Individual Handicap Tournament on Sunday 25th September. This will be open to any club member that has a valid handicap for the bow type that they wish to shoot. Thee event will be open to all bow types. For club members that do not have a valid handicap by the end of August, they will still be able to complete a normal Target Day if they so choose. All rounds will be shot at 6 arrows an end. There will be medals for 1st, 2nd and 3rd places and a small trophy for the winner. In the event of tied scores the person with the most X’s will win, if this does not give a winner then the person with the most gold’s will be the winner. If this still gives a tied result the person with the most hits will win, and if there is still a tie it will be one arrow shoot off nearest to the centre wins. If you would like to participate then please let me know which of the above rounds you would like to shoot and which bow type you will be shooting with. Responses by the end of August please. Could members please turn up by 1pm so that we can get the range setup ready to start shooting as early as possible. We are looking for volunteers to come and help with some general maintenance jobs at the range on Saturday 7th May, starting at 9am. We want to move the metal shed from the top compound to the range, digging out an area to let us attach it to the back of the wooden shed. Hence any and all volunteers are welcome…….